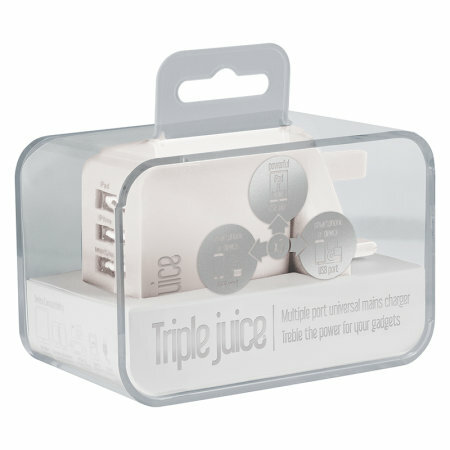 Designed to quickly charge tablets, smartphones and so much more, the Triple Juice Mains Charger in white, features three USB ports and delivers 3.4 Amps to fast-charge even the largest and most power hungry devices. Discontinued - not available for purchase We are sorry, but this item is no longer available for sale. Please make sure you explore our impressive range on Mobile Fun to find an alternative that will suit your requirements. You can also contact our Customer Services team for help in finding a suitable item. Good price; fast delivery; does what it says on the box. What more could you ask for? Designed for easy use and convenience, the Juice Triple USB Universal Mains Charger allows you to charge any USB cable supported mobile devices. Using your existing charging cables, the UK USB Mains Charger 3.4 Amp output can be used to charge smartphones and tablets including, iPhones and iPads as well MP3 players, digital cameras and e-readers. This Juice charger features a total 3.4 Amp output which means it will charge the latest smartphones and tablets quickly so your device is ready to use when you need it. 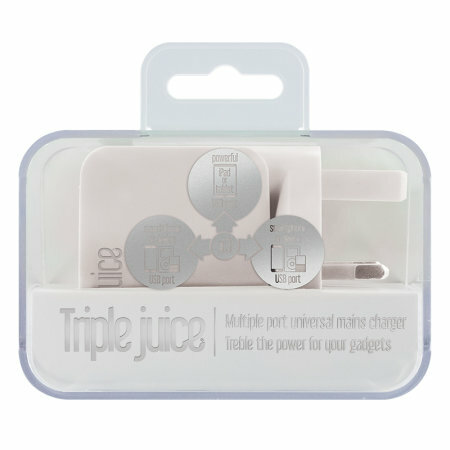 The Triple Juice Charger pushes an impressive 2.4A current through the first USB port and 1A to each of the USB outputs. With 3 USB ports, this Juice USB Mains charger can charge three devices at the same time from a single mains power socket. This ensures that your area is kept organised and space efficiency is maximised. 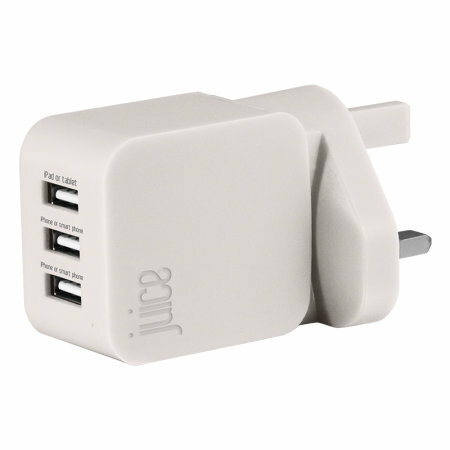 The Juice 3.4A Triple USB Mains Charger's compact and sleek design makes the charger perfect for travel. With the USB Mains Charger you'll only need to use one charger for all your devices. Not only is the USB Mains Charger extremely portable, but it is also extremely sleek and stylish. A low cost, reliable shipping service, suitable for your less urgent orders. This service is not tracked. Usually delivered within 10-15 business days. A secure, tracked and reliable mail service. Orders sent using this method usually get delivered in 4-6 business days. A fast, secure and reliable service shipped by DHL delivered in 2-3 business days. Your item will receive priority handling, and will benefit from a full online tracking service so can check your package's progress along the way.